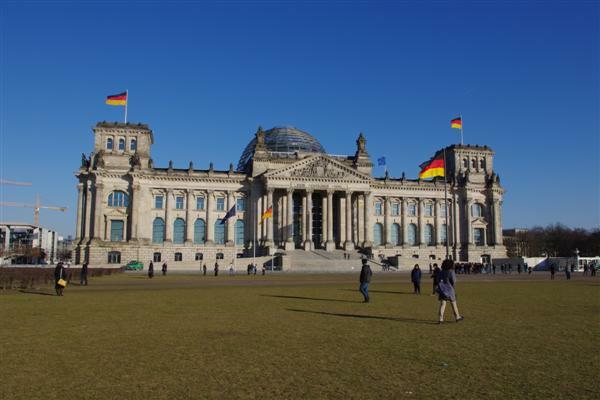 As I wrote earlier post about free thing to do in Berlin I was planning to visit Reichstag building. I did it, but it required some preparation in advance. Last time I was there 15 years ago. You could just show up and go to the top of the dome straight away. The rooftop terrace and the dome are closed all day on 24 December and from 16.00 hrs onwards on 31 December. In addition, the dome will be closed to visitors from 12 to 16 March, from 9 to 13 July, from 23 to 27 July and from 8 to 12 October to allow cleaning and maintenance work to be carried out. The roof terrace can still be visited when the dome is closed. But the dome is closed for cleaning right now – from 4 to 8 March, and I wasn’t able to visit dome today, though the view from roof terrace also very nice and it is worth a visit even if the dome is not accessible. One more important thing – don’t forget to bring a valid identity card or passport or equivalent form of photo identification with at the day of you visit as it will be checked at security point.